Oh Shenandoah, I long to see you. Virginia wineries are opening at a frantic pace. Lisa Adams opened 612 Vineyard in 2014 and I had been meaning to stop in for some time. I was recently in the Northern Shenandoah Valley and not far away, so I made a short detour. The winery is located on the western slope of the Blue Ridge and just a short distance from the West Virginia border. It is not terribly far from Northern Virginia and the large mass of wineries in Loudoun County, so it is very accessible. There are no grapes grown at 612. All of the fruit is purchased from Randy Phillips at Cave Ridge down in Mount Jackson. Randy also produces all of the 612 wines. That is not a bad thing. Randy is one of the most highly regarded winemakers in the Shenandoah Valley. So you can imagine that the 612 wines are well crafted. I tasted nine wines during my visit and they all lived up to the reputation of the winemaker. I placed stars next to four of the wines indicating that they were of particular note. For brevity, however, I’ll mention just a couple. I have had an opportunity to taste some exceptional Traminettes recently. If you are unfamiliar with this varietal, it is a Gewürztraminer hybrid. The 612 offering was done sur lie, meaning that it spent time in contact with the expended yeast. This gives the wine particular character, and this example was very complex and balanced with beautiful stone fruit and apple notes. The other wine I feel compelled to mention is the Port-style "Sultry and Red." Unlike many similar wines I have tasted in the Commonwealth, this one actually smelled and tasted like a Port. I must tip my hat to the winemaker it is an amazing wine. Things were a little slow, when I was there. A small group wandered in shortly after I arrived and a musician was playing music in the corner. I found it very low key, which was fine with me. Lisa poured my wine. She was very gracious, answered all of my questions and engaged with me along with the other guests. I think it is important that we support these new wineries as they find their legs. 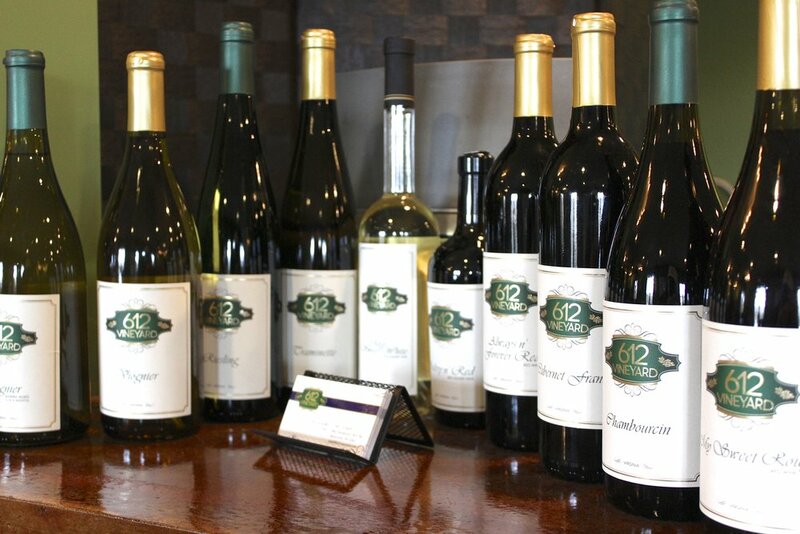 612 sits among a small cluster of wineries and is easily accessible from Route 7. If you happen to be passing through or exploring wineries in the Northern Shenandoah, make it a point to visit. When you do, please let me know what you think. When people speak of Barren Ridge Vineyards, in addition to the wine, they always mention the view and the beauty of the property. Sadly, I have only visited in the winter. Last time I was in the tasting room was around Christmas in 2013 and it was a very grey day. My frame of reference had little to do with the view or the property. So I found a weekend in June and one with perfect weather as the day to mount my return. I really needed to update my blog and, of course, get better photographs. 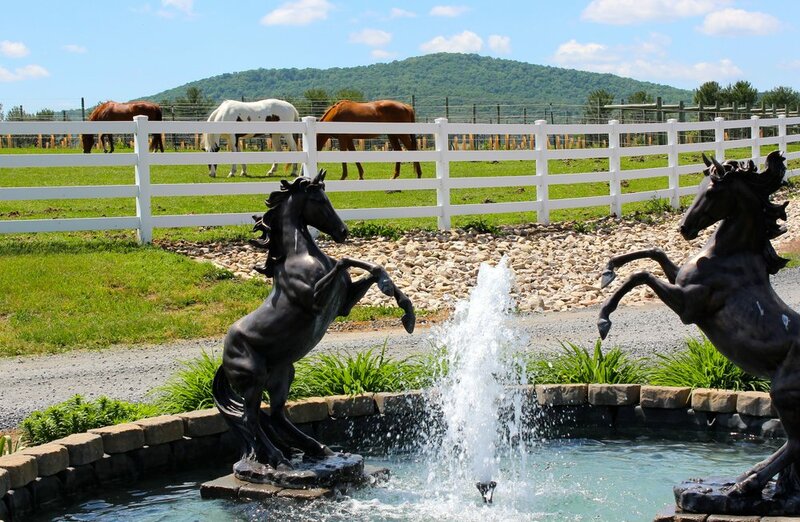 If you have never visited Barren Ridge, it is in the southern half of the Shenandoah Valley not far from the town of Fishersville. It occupies a ridge line on the western slope of the Blue Ridge and looks west at the distant Allegheny Mountains. It certainly is a picturesque spot and one where you may want to spend a little time. While you are in the area, however, you might consider visiting some of the other nearby wineries or taking a side trip to Staunton, which was recognized as one of the best small towns in America. The property was originally an apple farm. In 2004, after the death of John Higgs’ father, he and his wife Shelby stepped in to prevent the sale of the farm and to keep the land in the family. It was a retirement project of sorts. John and Shelby were already in their sixties, but they wanted to clear the hillside and plant grapes. The conversion from apples to vines was an enormous undertaking that required two full years. Given the pristine state of Barren Ridge today, it is hard to imagine what it must have looked like then. John and Shelby, now well into their seventies, are still running day to day operations and there is no sign that they intend to relinquish control. After I arrived, I availed myself of a tasting. Grace poured my wine. A hospitality student from James Madison University, she was on her sixth shift behind the bar. If she had not told me that, I might not have guessed. She did a brilliant job stepping me through the offerings and even let me sample a few wines that were not on the standard tasting list. The quality of my experience is certainly a tribute to Grace, but also to the quality of orientation Barren Ridge provides their staff. It was a first-rate experience. Anyway, I tasted a total of thirteen wines. All of them were very good, but I am likely to lose you, if I try to deliver notes on each one. The whites included a Vidal Blanc with crisp citrus notes, Tinkling Springs (a white blend), a lightly oaked Chardonnay, Harmony (another white blend) and a lightly oaked Viognier. The Tinkling Springs and Harmony each have P. Buckley Moss paintings on their label. Moss is from the area and still lives there despite her standing in the art world. Part of the proceeds from each is donated to charity. But I digress slightly. The Riesling was my top pick with its crisp acidity, minerality lemon notes. While I enjoyed each of the whites, the reds are the real story. Among the reds, there was a nice, light-bodied Merlot, a lovely Cabernet Franc, a light-bodied Meritage and a Port-style Chambourcin. Touriga was the first red Barren Ridge produced and it is one of the most popular. I noted cigar box on the nose and dark red fruit on the palate. I was particularly taken by the Petit Verdot. It had hints of coffee, cherry, a bit of vanilla and a crazy-long finish. It is a great wine, but needs a couple more years in the bottle. Following my tasting, I was fortunate enough to spend a little time talking with Shelby. She is a brilliant story teller and spent quite a while filling me on the history of the property, background on the winery and provided information on day-to-day operations. It is Shelby who often leads guided tours of the property and she seems to thrive on that responsibility. She and John are very active in the local wine trail and events around the valley. They are leading a very active and busy “retirement” and it was very kind of her to give me so much of her time. Aside from tastings, there are a number of private and business events that are scheduled for the upstairs event space. In addition, the winery sponsors a number of fund raisers. The business is very much integrated into the larger community and they are huge promoters of the Shenandoah Valley. I strongly recommend a visit and I suggest visiting during a favorable season. This is one of the Shenandoah Valley’s premier wineries and certainly deserves our attention. After you stop in, please let me know what you think. In the historic James River Valley, not far from the village of Eagle Rock, you’ll find Blue Ridge Vineyards. We drove in on Route 43 from the town of Buchanan, which made the winery seem very remote, but there are easier ways to get there. No matter which route you take, the final approach on Shiloh Road really feels like a drive into the mountains. After all, you will be driving into the mountains. When you turn down the winery road, you’ll immediately notice one of the most breathtaking views in the state. You’ll be looking back toward the James River Valley and the mountains that lay on the far side. As you continue down the drive, if you’re not too preoccupied by the view, you’ll notice the gnarled thirty-year-old vines that Barbara Kolb and her husband planted back int he 1980s. The plan for the vineyard was originally to cultivate and sell the grapes. At the time, the Shenandoah Valley was producing mostly cattle and corn. People thought they were crazy, but they moved forward with their plan despite the naysayers. The vines were planted between 1200 and 1400 feet on a north-facing slope, which happens to be ideal. The irony is that this was just dumb luck. Thirty years ago, there was almost no viticultural expertise in the Commonwealth. As it turns out, the Blue Ridge vines are now producing some of the best fruit in the state. In 2005, Blue Ridge began using the harvest to produce their own wines. The further south you travel in Virginia, the more likely you are to encounter sweet wines. That’s not the case here. The wines are made to suit Barbara Kolb’s palate. That is to say they are well crafted and primarily dry. Unfortunately, Blue Ridge lost their entire 2013 crop during the extreme rains of that year. As a result, they ran through most of their inventory and had to purchase grapes locally. So there were five very young wines on the menu, but I think they did a great job with what they had to work with. There was a very nice semi-dry Riesling and a recently bottled Traminette. I will say that there were some unusual blends. Big Bear Red, for instance, is a blend of Riesling and Chambourcin. I’ve never seen these two grapes used together, but it actually worked. Kudos to the winemaker. But what about the old-growth vines? I really wanted to try a wine made exclusively from estate-grown fruit. I purchased a bottle of the 2009 Cab Franc Reserve and took it home. I opened it for dinner just last night. Sweet Baby Jesus! It was everything you could ever hope for in a Virginia wine. It was full of rich red fruit on the nose and palate that mingled with spice and pepper. There was so much happening in my mouth, I couldn’t keep track of it and then there was a finish that just went on for days. If this is what those 30-year old vines are capable of, sign me up for more. And let’s not forget the winemaker. That juice didn’t get in the bottle on its own. The tasting room is situated inside a very rustic looking barn, but that’s deceiving. A walk around to the back of the structure will reveal a covered area filled old dining room tables, strings of lights and chandeliers. It’s such a lovely and inviting space with it’s shabby-chic furnishings. And it’s open on the back end, so you can still admire the view, while a cool mountain breeze blows through the space. Blue Ridge Vineyard is a day trip from most points in the Commonwealth. It’s two hours from Charlottesville and probably three from DC or Richmond. It is fully worth the drive. If you’re inclined, a check of their website will reveal an extensive list of public events; if you want to listen to music while sipping wine and taking in the mountain air. Everything about this place screams "road trip," so get on out there and see for yourself. It frequently amazes me how quickly the Virginia wine industry has evolved in such a short period of time. I have been observing it for over twenty years and it has continued to improve but the pace has proceeded to quicken. It is difficult to keep up. A case in point is Bluestone Vineyards in the Shenandoah Valley. I last visited Bluestone in July of 2014. It was a small winery making good wine with a tiny tasting room at the bottom of a hill. I am certain that I said some nice things, but it did not really knock my socks off. So I returned two and a half years later and it is like a completely different place. It just found the “wow” factor that was missing and that will certainly make it a go-to winery for everyone in the area. Going a step further, its reputation will likely draw visitors from far beyond the Shenandoah. First of all, they moved the tasting room up the hill. Brilliant move! The view is simply stunning. It looks out across the rolling hills and farmland at the distant Allegheny Mountains. There are tables and chairs tastefully arranged along the ridge line to accommodate guests. Inside, the tasting room is just a little roomier, but it has a fireplace and seating, which was largely absent from the original space. Curt and Jackie Hartman have also continued to plant vines. They purchased another 22 acres down the road, where they have so far planted 7 acres. When you add this to the 3 acres across the road and the original acreage, they have a total of 22 acres under vine and there is still room to plant. All of this fruit results in between 5000 and 6000 cases annually and we are likely to see those totals grow over the coming years. Oh, but I need to say a few words about that wine. Curt started out as winemaker, but his son Lee took over in 2011. At the time, he was probably the youngest winemaker in the Commonwealth. They do consult with Michael Shaps, but Lee is really the winemaker. Aside from help from Shaps, Lee’s formal wine education includes classes at Piedmont Community College and Seminars at Virginia Tech. It is fair to say, however, that he has grown into his current winemaking position and that is obviated in the quality of the wine. I tasted the white and reserve flights for a total of eleven wines. The whites included Sauvignon Blanc, Viognier and Traminette, but the Estate Chardonnay was the real standout. I am not alone in that observation, it just won double gold in San Francisco. The reserve flight was all big reds, which really appealed to me. There was an exceptional Chambourcin along with a Petit Verdot that you can just sink your teeth into and then there were three different Bordeaux blends. All were great wines, but the Houndstooth… OMG! It is just crazy good. I got lost in the aromas of cigar box and leather. On the palate, it is complex, showing hints of cocoa mingled with the fruit and a finish that seemed to last forever. I took some bottles home to pair with the right company and the right food. Absolutely brilliant wine. It is fair to say that I was completely blown away by my most recent visit. The staff was knowledgable and very friendly. The relaxed and informal atmosphere created conditions that make it easy to linger for hours taking in the view and sipping one of the excellent wines. Let me place emphasis on the words “excellent wine.” Bluestone Vineyard is one of those great Shenandoah wineries that I keep telling you about. You need to get over there and see for yourself. When you do, let me know what you think. Just east of Harrisonburg and only minutes from Massanutten Resort is one of the Shenandoah Valley’s newest wineries. When approaching the 161-acre estate that is home to Brix and Columns Vineyards, you will likely be struck by the Jeffersonian appearance of the buildings. That resemblance is not lost on owner and University of Virginia (UVA) alum Steve Pence. It is intended as a tribute to UVA, which is Jefferson’s university. Steven and his wife Stephanie opened the winery in April of 2017 along with the release of seven Brix and Columns wines. The couple works with Michael Shaps, who is both consultant and winemaker. Production currently stands at about 1000 cases annually with a long-term goal of between 3000 and 5000 cases. There are currently eight acres under vines, but they are not yet producing fruit. Shaps is helping source grapes from around the Commonwealth, so that the tasting room can begin pouring wine. The hope is to eventually expand that acreage to 15 or even 20 and produce exclusively estate wine. Steven also discussed to potential for producing wine on the property, but these are still early days for Brix and Columns. When I stopped in, I had an opportunity to taste the Brix and Columns offerings. With Michael Shaps making the wine, it goes without saying that everything on the menu was of excellent quality. I sampled three well-balanced whites that included a Chardonnay, Viognier and an aromatic blend of Vidal, Traminette, Viognier and Petit Manseng. The single-varietal Viognier really stood out. The stone fruit notes stood out but did not overpower the acidity in this extremely well crafted wine. Before moving on to the reds, there was a very nice rosé made from a field blend of seven different grapes. The tiny bit of residual sugar brought out the hints strawberry making it a great wine to accompany a light meal. The reds included a Cabernet Franc, Petit Verdot and a blend. All were exceptional wines, but the Cab Franc was just off the charts. It was a lighter bodied wine with a lot of red fruit, structured tannins and a hint of spice without any green notes. It is a very nice example of that varietal. Overall, the experience was first rate. The tasting room was well staffed and the wine steward who poured my tasting was able to talk about all of the offerings and wine in general. I do think that the wine country feel will improve as the vines mature, but that will only improve a view that is already spectacular. The tasting room looks across the valley toward Massanutten Mountain. It is a beautiful venue. I will certainly lend my endorsement to Brix and Columns Vineyards. If you have not been or, heaven forbid, not heard of this winery, make it a point to get over there. After you do, please let me know what you think. I have long been saying that the Shenandoah Valley is capable of producing some of Virginia’s best wine. The soil and climatic conditions are ideal. If vineyard sites are selected with an eye toward proper drainage and optimal sun exposure, it is very difficult for producers in other parts of the Commonwealth to compete with the quality of the resulting fruit. One of the vineyards that illustrates this potential is Cave Ridge Vineyard located in the northern half of the Valley near Edinburg. Cave Ridge is about ninety minutes from Charlottesville. In other words, it is a winery that I have to make a deliberate effort to visit. I had not been there in over two years, so I made the drive. Despite the marginal winter weather, it proved to be a great visit and I was able to spend the better part of an hour talking with owner/winemaker Randy Phillips. Randy’s family background revolves around agriculture, so he brought this understanding up the land to his project at Cave Ridge. He and his wife Karen purchased the Mount Jackson property in 2000 and began planting the following year. Today there are 25 acres under vine. Much of that is on the Cave Ridge estate, but planting has been expanded to other nearby acreage. Randy makes sources grapes to and makes wine for a handful of other Virginia wineries, but nearly all of the wines bottled with the Cave Ridge label are produced from grapes on the original estate. 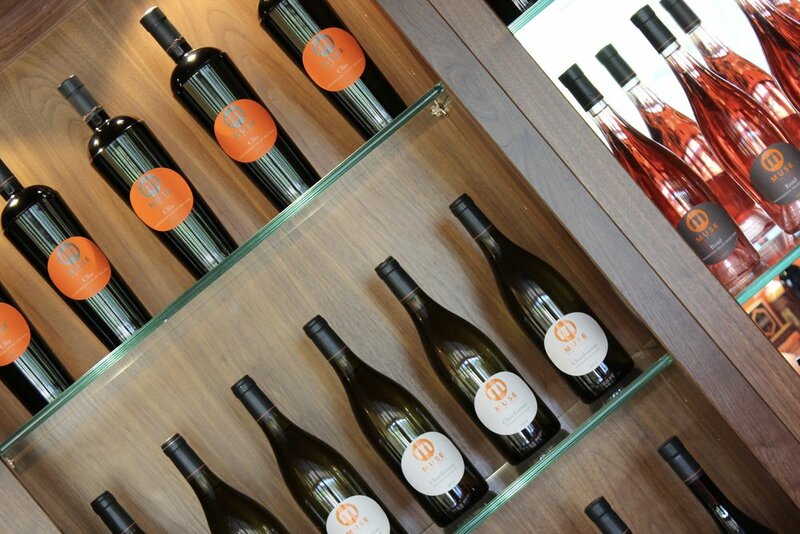 After stepping up to the tasting bar, you will discover a variety of tasting options. There is the regular or the reserve menu, but Cave Ridge has started something new. 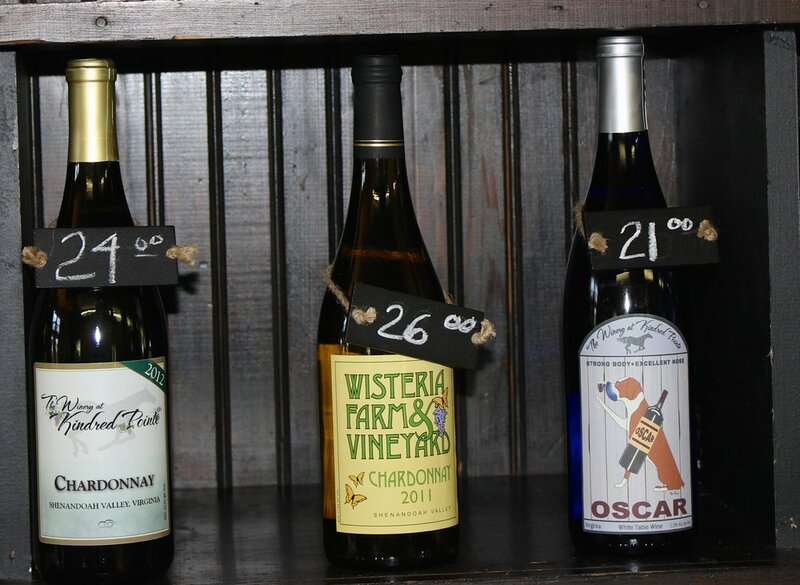 Visitors can select to customize a tasting flight of red, white or sweet wines. There is also an option to select four offerings from a list of available library wines. I cannot say that I have encountered this library tasting option before, but I love the idea that older wines are available for tasting. It is currently possible, for instance, to organize a flight of just 2010 wines. I think it is a great concept. Since the winemaker was pouring, my tasting was sort of all over the map. I started with the regular tasting menu and then we moved on to things that Randy just wanted to show off. I will point out that nearly everything I tasted is available or will be available in the near future. Among the whites, I have to make special note of the Viognier with its stone fruit notes and big mouth feel, but the Riesling is the main event. It is done in an off-dry style, but the residual sugar is perfectly balanced against the acidity making it one of the best examples of that varietal you will find in the state. I must point out that the wine is only part of the excitement at Cave Ridge. They host an annual Taste of the Shenandoah festival that features their wines along with food from local producers in the Valley. On the day that I visited, they were preparing for a wine pairing dinner that featured four guest chefs. So keep you eye open for some of the planned events. I promise you that a trip to Cave Ridge Vineyard is entirely worthwhile. You really need to get over there and find out for yourself. I am quite certain that you will come away singing the praises of the great wine and beautiful venue. After you make it over there, please let me know what you think. On the western side of the Shenandoah Valley, pressed up against the Allegheny, at the top of a narrow gravel road, you’ll encounter one of the most beautiful spots in the state of Virginia. To reach that gravel lane, requires a drive along mountain roads to the village of Star Tannery. Upon reaching the terminus of your journey, you’ll find Cedar Creek Winery and Vineyard looking out across the acres of vines at a view of Paddy Mountain on the opposite side of the small valley. It’s a view that anyone would feel lucky to wake up to each morning. In 1999, following a career in law enforcement, Ron Schmidt purchased 77 acres on the side of the western slope of Little North Mountain. He came to wine growing almost by accident, after a friend convinced him that his property was ideal for viticulture. He planted five acres of Chardonnay and Cabernet Franc and spent nine years selling his fruit and just learning how to manage a vineyard. Along the way he made small amounts of wine for personal consumption. Friends were impressed by the quality of his limited-production wine and convinced him to make the next step. In 2008, Ron stopped selling his fruit and began processing it for his own wine. He had taken a few winemaking courses, but didn’t feel completely up to the task. He considered hiring a wine consultant, but the fees were exorbitant. In the end, John Jackson of North Mountain offered assistance. John is still consulted on occasion, but today Ron looks completely at home in his winery. A tour of that facility is a standard component of every visit and he enthusiastically steps visitors through each step of his winemaking process as he explains all the tools he uses to craft his wines. Now Cedar Creek Winery takes its name from the small stream that flows along the valley floor at the base of Little North Mountain. It is a small boutique winery, with emphasis on the word small. The winery produces only about 500 cases each year from the fruit growing on the estate. Cedar Creek doesn’t make dozens of different wines. They’re not overreaching. Only Chardonnay and Cabernet Franc single-varietal wines are produced and strictly from estate-grown fruit. Grapes are never purchased from other vineyards. If an entire crop is lost, that vintage will be skipped. Ron Schmidt feels strongly about the quality of his crop and will not compromise. This is evident in the quality of the wine. The Cedar Creek wines are presented as part of a vertical tasting and during my visit we I tasted two vintages of Chardonnay and four of Cab Franc. I love this kind of tasting, because it really allows the visitor to experience the impact that the growing season has on the character of the wine. It’s a wonderful educational tool. The Chardonnays were both perfectly balanced with nice mouth feel. The 2012 had beautiful pear and tropical fruit notes. The 2011 was harvested before the rain, so was not impacted by the foul weather that struck during harvest. It contained layers of complexity, with nice crisp tropical notes. You’d be hard pressed to find a better Chardonnay in the Commonwealth, but the main event was yet to come. I must say that I had tasted a Cedar Creek Cab Franc before. Another Shenandoah Valley winery was pouring the 2010 as part of their tasting. It was this experience that sent me to Cedar Creek. I would have ended up there eventually, but the quality of that wine was so extraordinary, I felt a responsibility to visit sooner. We started with a 2011 Cab Franc. I’d recently had a very good one of the same vintage that was made with fruit from the Valley. The Cedar Creek example was spectacular. It had a big jammy nose, great color and beautiful cherry notes. Incidentally, it was the only Cab Franc to win gold in the 2014 Governor’s Cup, which is pretty impressive when you consider that 2011 was one of the worst vintages in the history of Virginia viticulture. It was a great wine, but not the best of the tasting (in my opinion). With each subsequent vintage, the wines just seemed to get better. Well, I’m still partial to the 2010. The 2009 and 2008 were both superb, but the 2010 was dark and inky with lots of dark fruit and complexity on both the nose and palate. There’s just a lot packed into that wine. Ron revealed that the 2008 is his personal favorite. I can completely understand that. Each Cab Franc is absolutely amazing and selecting a top pick really comes down to individual palate. I’ll go out on a limb and say that Cedar Creek is making one of the best (if not the best) Cab Franc in Virginia, which likely makes it the best on the East Coast. Until recently tastings were conducted by appointment only. Even now the tasting room is only open from April through November, which makes sense based on it’s fairly remote location. It could be tough to get up there in the winter. I will submit that anyone exploring Virginia wineries should strongly consider a visit. With the winery tour and vertical tasting, Cedar Creek offers one of the best educational tasting experiences in the Commonwealth. The reputation of the wine is gathering a dedicated following and I am definitely a member of that dedicated throng. I’ll be a repeat visitor, so maybe I’ll see you there. I drove north through the Shenandoah Valley, exited the interstate at Weyers Cave offramp and headed east toward the Blue Ridge Mountains. It is a bit of a drive from Charlottesville, but completely worth the trip to Crosskeys Vineyards. 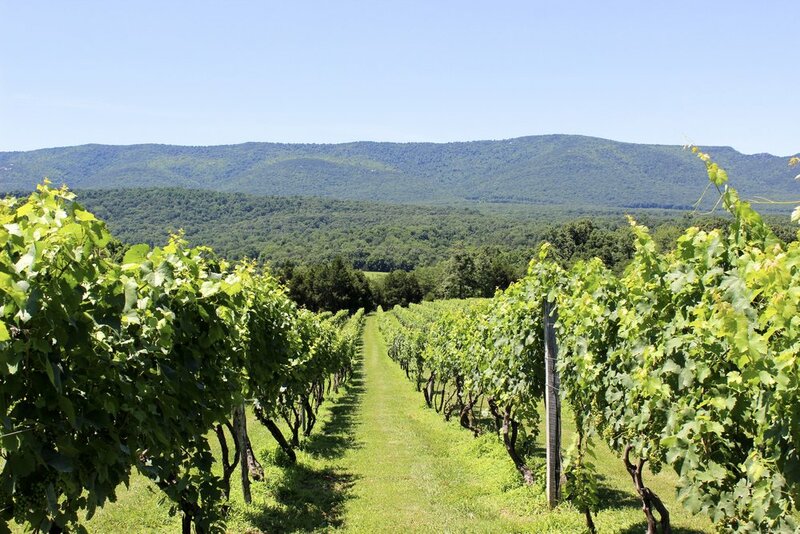 It is one of a handful of wineries in the Shenandoah American Viticultural Area (AVA), that are making some of the best wine in Virginia. That is not an exaggeration. The “Valley” has the best growing conditions in the state. The only thing that prevents rapid expansion of wineries, like other parts of the Commonwealth, is lack of a large population center to purchase the wine. Direct sales is the only way a small winery can make enough to survive. The approach to CrossKeys is impressive. The property has thirty acres under vine, but it looks like much more. The mountains close in around the winery, so that visitors are offered a Blue Ridge vista that is simply stunning. This, I am certain, was a large part of what inspired owners Bob and Nikoo Bakhtiar to purchase the property. They constructed the winery complex to present a slightly Spanish Mediterranean feel with its courtyard and archways. 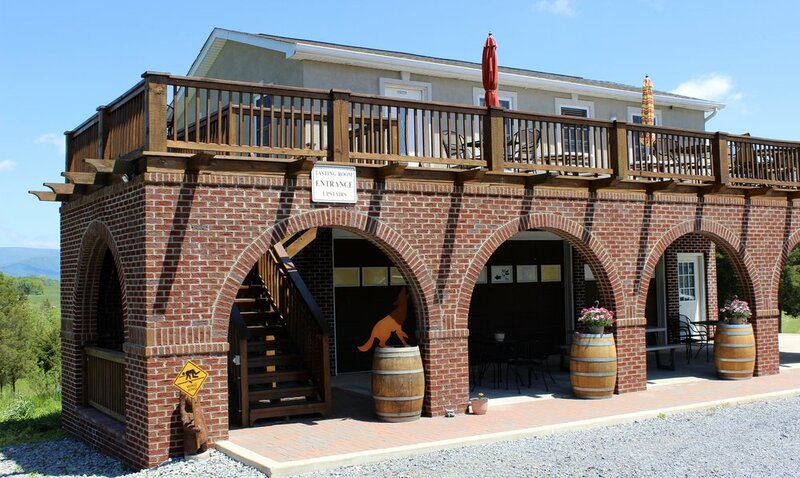 The building adds to the charm of the property and makes this easily one of the most beautiful wineries in Virginia. Again, that is not an exaggeration. Entering the courtyard, the tasting room is in the right wing of the building. The left wing contains a bistro and in the middle is a very large event hall. I am told that the venue is booked for weddings at least a year in advance. When I arrived, there was a painting class taking place in the hall and live music in the bistro. For a relatively remote winery, the place was really hopping. Fortunately, the crowd was disbursed and there were only a few visitors at the tasting bar. At the tasting bar, I was greeted by Saam Bakhtiar, who is the eldest son of the owners and the Director of Operations. Saam stepped me through each of the offerings and brought me up to date on what is happening at CrossKeys. He told me that the winery is currently producing about 7500 cases of wine annually. There is a possibility that more fruit can be planted and production can be ratcheted up to 10,000 cases, but the plan is to maintain quality, so there are no immediate plans for increases in quantity. They started planting their first rows of Petit Verdot in 2001 and opened for business in 2008. So they are still pretty young, but you would not guess that based on the quality of the wine. We started with a Chardonnay, which was excellent. The only other white was the Joy White, which is 100% Vidal Blanc and it is hands-down fabulous. It is a perfectly balanced off dry wine, with beautiful peach notes and enough acidity to make it food friendly or just drink by the glass. The real story, however, is the red wine. I tasted an amazing Chambourcin, which was followed by a nice Merlot. The Cabernet Franc is just out of the park and I can say the same about the Heritage, but I want to tell you about the Petit Verdot. So often I taste a PV that I am told is fabulous and I leave thinking they should have used it in a blend. Not so with the CrossKeys PV! It is a big, inky wine with tons of dark fruit, dark chocolate and firm tannins. Oh, and the finish just goes on forever. As soon as I tasted it, I asked how many medals it had won. The answer is, several. It is a great wine that can spend many years on the shelf. So, if you are not convinced to visit CrossKeys, I do not know what else I can tell you. It is distinctly one of the great Shenandoah wineries. Everything about the experience from the views to the wine is absolutely first rate. I do not care where you live. I strongly recommend that you plot a course for CrossKeys. See what they are all about and when you do, let me know what you think. A visit to the tasting room at Glen Manor Vineyards is all that is needed in order to know that something special is going on there. The motto at Glen Manor is “wines with a sense of place” and that is the first clue. Jeff White, owner and winemaker, is a farmer rather than a chemist. The quality of his wine is entirely dependent on what takes place in the vineyard. The fruit comes exclusively from the 14.5 acres planted on the steep slopes above the tasting room and that is really where all the magic happens. Well… it is not exactly magic. Jeff spends his days managing the vines. That is the key to great wine. The terroir or “sense of place” is expressed exclusively through the fruit. Some wineries may apply slight of hand to enhance the “quality” of the wine. Sugar or coloring, for instance, might be added. At Glen Manor it is all about vine management. Jeff drops a lot of fruit. In other words, a percentage of the grapes are not allowed to mature. They are cut and discarded, so that all the energy produced by the vines will be channeled into the remaining fruit. There is nothing magic about it at all, it is just good viticultural practice. Glen Manor is a premier Virginia winery making world-class wines. So when you step into the tasting room and sample the wine, you do not need to be a sommelier or master of wine to recognize the quality. It is evident. The ripeness and quality of the fruit really shine through. Glen Manor produces somewhere in the area of 2500 cases of wine annually. Unlike many wineries, you will not find 15 different wines on the tasting menu. Jeff produces up to five wines in any given year. Three of these will be red blends. Depending on the time of year, there may be fewer options on the menu. They do frequently sell out of some wines. On my most recent visit, I tasted five and I do not even know where to start. Well, I should start at the beginning. I tasted the Sauvignon Blanc. It was a crisp and clean with a beautiful nose and perfect balance. They were also pouring a very nice dry-style Rosé, but let me talk about the reds. Oh, the Cabernet Franc! It was made the way Cab Franc is meant to be made. It was big, almost jammy and definitely the product of ripe fruit. There was not even a hint of green pepper. It was showing a little spice and a wonderful finish. Great wine! As I said earlier, there are three blends. They are tiered by level of quality, which is reflected in the price. They are all great wines. The price point relative to quality makes the less expensive blends very popular and they tend to fly off the shelf. Having said that, I am compelled to say a few words about the Hodder Hill, which is the high-end blend. OMG! It is big with layers of complexity, structured tannins and a finish to get lost in. It won gold in the Governor’s Cup. No surprise there. I took some with me. It is a wine I want to share and preferably with people who have never tasted a Virginia wine. It is a wine that will leave a lasting impression. I would be remiss if I did not mention the customer experience. I am always impressed by the level of knowledge of the Glen Manor wine stewards. They do not just rattle off some wine descriptors, but they are always able to engage in a deeper conversation. It is a social experience disguised as a wine tasting. I have to give huge credit to the tasting room staff. It is absolutely a first rate experience. I want to make one more note about the view from the tasting room. I know that this is a slightly superficial quality, but location is important and it adds to the experience. You will notice that all of the chairs on the lawn are pointed toward the mountain. It is better than television. Half way up the slope, you will see the vineyards and even higher up you will make out Skyline Drive. The Shenandoah National Park is right there in the back yard and it is just a gorgeous panorama. If you have never been to Glen Manor, you just need to go. It is everything you ever hoped for and more in a Virginia winery. If you have been, it is time to go back. Everything about the experience is simply stellar. So I want to hear from you. Tell me what you think. There was a bit of a mixup last year. Hunt’s Vineyard was placed on the Virginia wine map and listed as open for business. I and many others attempted to visit only to find a sign informing potential customers that they would not open until May of 2015. I recently drove back over the mountain and found that they are definitely pouring wine. So I spent a little time poking around and asking questions. When I arrived, Barry Hunt was working behind the bar of the small tasting room that is attached to his home. It is a small, family-run operation and Barry plans to keep it that way. One of the nice features of these smaller wineries is the opportunity to interact directly with the owner. So I spent nearly two hours tasting the wine, walking around the property and talking with Barry. You just can’t do that at one of the larger wineries. There is a lot of emphasis placed on customer experience. There is a very laid-back atmosphere about the tasting operation, but it gives you the impression that you can linger and talk or taste and be on your way. It is definitely family/child friendly with room outside for children to play and run around. It is also a dog-friendly establishment. Like so many Virginia wineries, Hunt’s was started as a retirement project. Vines were planted beginning in 2008 as Barry learned how to cultivate grapes. Today he has two acres under vine that include Chardonnay, Cabernet Sauvignon, Chambourcin and Dornfelder. The wine is produced exclusively from estate fruit with plans to produce only a couple hundred cases per year. So this will remain a very small boutique operation. We will have to wait and see how this plays out. To make the wine, Barry contracted Michael Shaps and this has paid immediate dividends. The Hunt’s 2012 Cabernet Sauvignon took first place at Virginia Tech’s Central Virginia Wine Festival. I understand, however, that Shaps is just making wine in the near term. Under Michael Shaps tutelage, Barry plans to eventually take over wine production. I tasted four of the Hunt’s wines. We started with an excellent, lightly-oaked Chardonnay, moved on to a pair of Cabernet Sauvignons and finished with a Chambourcin. The 2012 Cab Sauv was my top pick, with its big red fruit notes and soft tannins. I should also say a few words about the Chambourcin, because I am seldom very impressed with that varietal. The Hunt’s offering contained 2.5 percent residual sugar, which mellowed some of the grapes astringent qualities. As a result, it is an excellent gateway red that can appeal to many white wine drinkers. It was even balanced enough that I might drink a glass. So my final verdict is that Hunt’s Vineyard was worth waiting another year and making a second trip over Afton Mountain. If you are exploring Virginia wineries or just happen to be in Augusta County, you should make it a point to stop in. This small winery needs our support, but the quality of the wine and the level of hospitality should weigh heavily on your decision to visit. After you have checked them out, pleas let me know what you think. 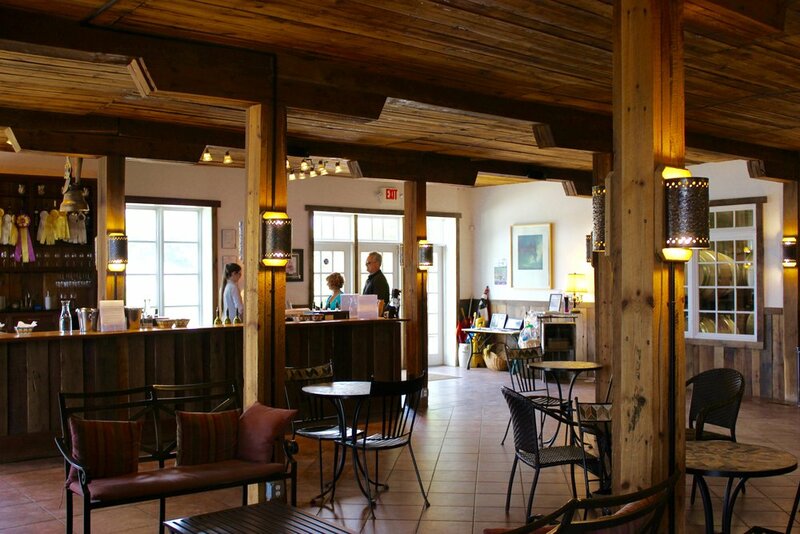 If you are familiar with Veramar Vineyard, you probably know that it is owned by the Bogaty family and you may also know that they have a tasting room on the other side of the Blue Ridge in Northern Virginia. The Bogatys recently opened a third tasting room near Winchester, Virginia. James Charles Winery and Vineyard does not pretend to imitate either of the other two vineyards. The route to James Charles took me through a suburb of Winchester and then a small industrial area. I was getting a little nervous about the venue, but after turning off the main road and onto the winery property, the character of the landscape changed dramatically. From the tasting room the view is all farmland and rolling hills with the Allegheny Mountains in the distance. The tasting room is very modern and built to capitalize on the view with large retractable doors. This allows the room to open onto the large stone patio in better weather. The tasting room is decorated in what might be described as a spring theme. As you enter through the front door, there is a space for club members in the far right corner. On the left, a long tasting bar runs the length of the wall. Between the bar and club room, there is plenty of seating. Despite the obvious cost of construction, great care was taken to make it a comfortable space where visitors might linger. It maintains a very cozy feel. The tasting lineup included a Riesling-Chardonnay blend and a very nice Viognier, but I felt like the real standout among the whites was the dry (Trocken) Alsatian-style Riesling. It is a perfectly balanced wine with nice minerality and fruit. The reds include a Petit Verdot that is still a little young, but it displayed fig and cassis notes that will come through more with a little decanting. They are also pouring a Zinfandel made from imported fruit. Although it was arguably the best wine of the tasting, it was not a Virginia wine. I was quite partial to the Ameritage Bordeaux blend. It has a lovely nose, dark fruit, a medium finish and nicely structured tannins. It is drinking well right now. I think the folks in Winchester are lucky to have a winery of this caliber on their doorstep and I encourage wine lovers from further afield to make the drive and support this new venture. For my part, I intend to return in the spring, so I can see the tasting room and property in a better season and spend a little more time exploring the grounds. After you stop in, please let me know what you think. After visiting over eighty percent of Virginia’s wineries, how is it possible that there are still surprises in store? Apparently so. Jump Mountain Vineyard is open only by appointment, but that is largely a formality. Mary Hughes and David Vermillion are working in the winery and vineyard most weekends and they are anxious to pour their wine and answer questions about their wine-making operation. Driving to Jump Mountain must be done deliberately. I will not say it is hard to find, GPS works well. But it is in rural Rockbridge County. I will point out, however, that it is an absolutely beautiful drive and completely worth the effort. After turning off Interstate 81, you will wind through the county’s backroads. Along the route, you will pass Wade’s Mill, a water-powered mill that has been in operation since 1882. Just before the final turn to Jump Mountain, you will pass through the charming and historic little village of Brownsburg with its antique shops and museum. As you turn off the county road and onto the vineyard property, Jump Mountain and Goshen Pass frame the tasting room and vineyards. It is an absolutely stunning view and worth the visit, but wait until you taste the wine. 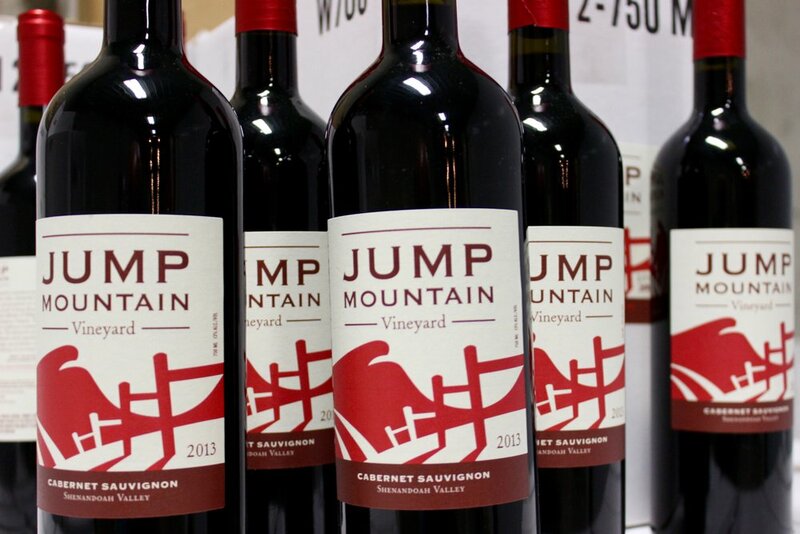 Jump Mountain is a small boutique winery with little distribution. To taste the wines, you really have to pay a visit. David started making wine at age ten after his parents gave him a winemaking kit. Making wine for home use, of course, is not the same as commercial production, so David and Mary brought in Mathieu Finot from King Family as a consultant. This was a brilliant move that significantly impacted the direction of both the vineyard and the winery. There are a few varietals in the vineyard that are still too young for a first vintage. Among these are the Italian grapes Refosco and Lagrein. I have not encountered these varietals anywhere in the Commonwealth, so I am excite to visit again in a few years and sample a final product. In the mean time, Jump Mountain is producing the Austrian varietal Gruner Veltliner. The Jump Mountain vines are not mature enough, so grapes are sourced from Nathan Bailey, who is also growing grapes in Rockbridge County. It is a well-crafted wine with the typical citrus notes and a truly lovely wine. This bodes well for the Gruners that will be produced from the estate fruit. I have to say that the main event is really the Cabernet Sauvignon. I was able to sample three vintages. The 2011 was the first Jump Mountain bottling. It was a tough year, but it was they still produced a respectable wine. The 2012 was a distinct improvement, but 2013 was just over the top. It was big, complex and jammy, with a finish that just kept going. Production levels are small, so there may not be enough for competitions, but this is a potential Governor’s Cup gold medal winner. I would drive out there just to buy this wine and I regret leaving without a bottle or two. After my tasting I lingered a bit and talked with David and Mary. They are eager to share details and they love entertaining guests. In terms of customer experience, there are no frills, but frills are not needed. Jump Mountain offers a first-rate tasting experience in a jaw-dropping venue and it doesn’t hurt that the wines are world-class. If you are exploring wineries or just driving through Rockbridge County, call ahead and make a reservation. After you stop in, please let me know what you think. I want to compare notes. Nearly three years ago, I was in Shenandoah Valley visiting wineries in the Mount Jackson area. I stopped in at Kindred Pointe Winery, which had just recently opened their doors. Despite the relative youth of their operation, I was impressed by their enthusiasm and by the fairly rehearsed manner in which they greeted and served visitors. Unlike most new wineries, it did not feel like a soft opening. As I recall, they were only pouring four wines under their own label. I fully intended to return in a year or so and see how things were developing. Time sort of got away from me, but I finally made the drive. Basically, Amy and Bruce Helsley purchased a fifty acre horse farm and converted it into a winery. The property still has something of a horse farm feel and the stable was converted into a tasting room, which adds to that motif. I am certain that it is a deliberate vibe and it certainly adds to the charm. Beyond this feature, a short walk around the property will reveal a series of trails, a protected wetland and about 6 acres under vine. So there is certainly room to explore. When last I visited, Michael Shaps was producing all of the Kindred Pointe wines. I am happy to report that this is no longer the case. All of the red wines are made on the property and white wines will soon follow suit. Much of the original vineyard was damaged during the harsh winters of 2013 and 2014, so they currently have only two acres producing grapes. They have replanted and will eventually expand the vineyard to about ten acres. So of the 750 cases produced annually, only 25 percent is made from estate fruit. 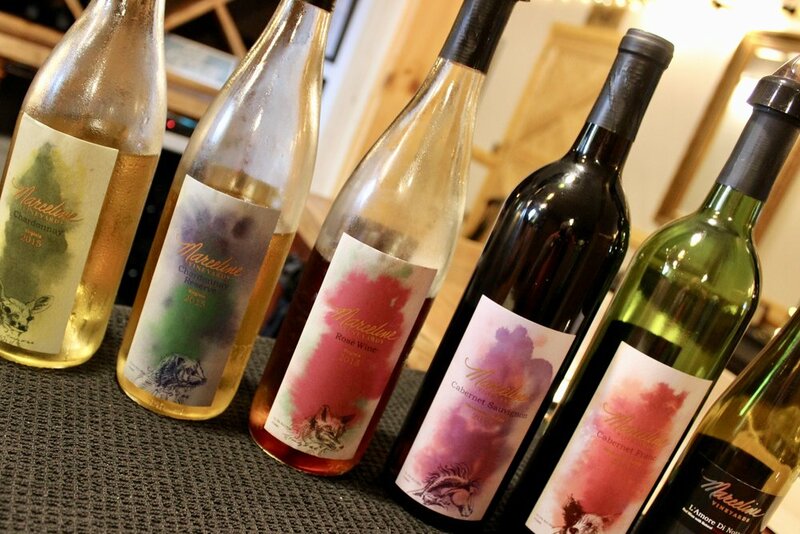 During my most recent stop, I tasted seven Kindred Pointe wines. They are no longer pouring wines from other wineries. Among the whites the standouts were the 2013 Chardonnay. The partial secondary fermentation gives it a big mouth feel without masking the fruit and still preserves a hint of crispness in the finish. The off-dry Vidal Blanc was another real winner. It is a perfectly balanced wine filled with big grapefruit notes. Among the reds, there is a well-crafted Malbec. This is a grape seldom found in the Commonwealth. The Kindred Pointe offering was a light-bodied, fruit-forward wine with round tannins. The Merlot is also worthy of mention. It is full of red fruit on the nose and palate and displays a hint of vanilla. When I stopped in there was a wine and painting event going on in the back of the tasting room. So there was a small crowd gathered. There are a number of the public events, but you will need to check their website for a complete listing. On the other hand, if you are not inclined toward participation in a Kindred Pointe event, there are a pair of fireplaces and a plenty of space to relax with a glass of wine after your tasting. It is a very cozy tasting room. It is always nice to revisit a winery and see what has changed. It seems to me that Kindred Pointe is on the right trajectory and it will be interesting to see how things develop over the next couple of years. In the meantime, I suggest you get over there and see for yourself. This is a winery that will achieve great things and while they are getting there, they need our support. So do stop in and when you do, let me know what you think. The Blue Ridge Mountains are just minutes from downtown Lexington, Virginia, but the rural nature of the landscape feels like miles from the nearest urban center. This is where you will find Lexington Valley Vineyard. It feels remote, but is really minutes from Interstates 64 and 81. 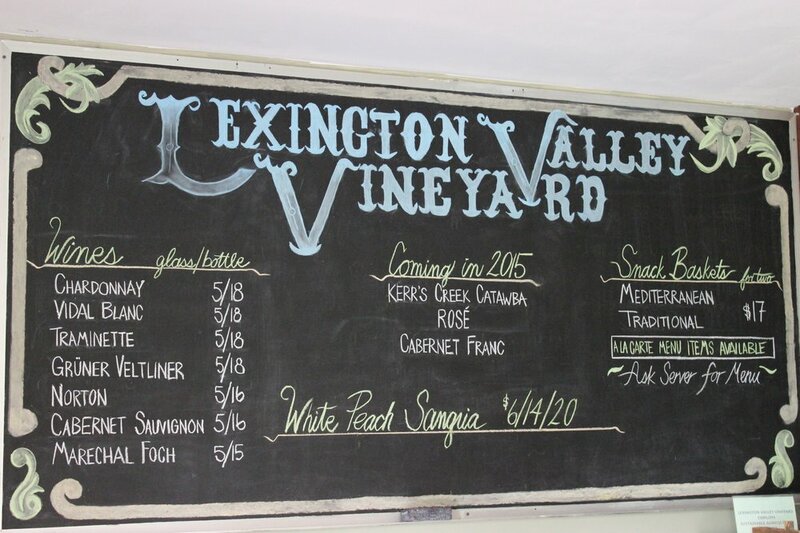 The sixty-seven acre Lexington Valley property is home to a small family farm winery, where both hybrids and vinifera have been grown for the last fifteen years. Since the first vintage was bottled in 2007, production has remained rather low. The five acres of fruit are used to produce between 400 and 500 cases annually, but there are plans to expand that total to 1000 cases. Even at that level of production, this is a small boutique winery. Emphasis is really on quality. I tasted eight wines during my visit. It is an interesting lineup of well-made wines. The white hybrids include Vignoles, Traminette and Vidal Blanc. An oaked Chardonnay was among the white vinifera, but the Gruner Veltliner was a real standout. crisp, balanced wine, with distinct lime and herb notes. This Austrian varietal is sourced from elsewhere in Rockbridge County, but Lexington Valley is working some magic with that grape. The reds being poured included a young Cabernet Sauvignon, a Foch and a Norton. I will say that the Norton was one of the best examples of that hybrid I have ever tasted and that is saying a lot. It had wonderful Port aromas, lacked the typical mid-palate astringency and was fruit forward without being overly fruity. I’m not always a Norton fan, but I can recognize a good example and the Lexington Valley offering is one of the best in the state. Lexington Valley is a lovely venue with room to sit outdoors and admire the countryside. The tasting experience is also well constructed, informal and relaxed. There is every reason to visit. They are open most days. It is recommended that you call ahead, but this seems to be a formality. 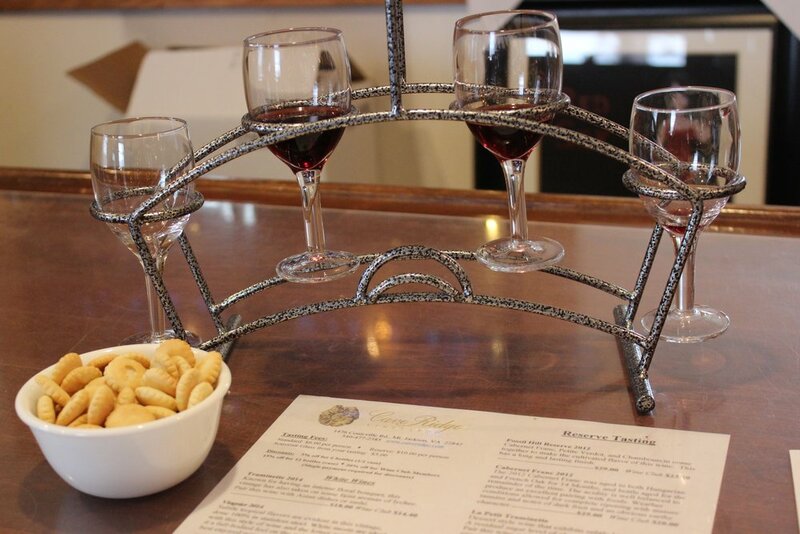 For those intent on lingering with a glass of wine, snack baskets can be purchased in the tasting room. There is also room outside for couples with children. So don’t hesitate. Make the drive and after you do, please let me know what you think. Almost by accident, I discovered that there were three wineries in the Shenandoah Valley that are not on the current Virginia winery map. I take a certain pride in being aware of developments in the valley, so this oversight needed to be corrected. In short order, I cleared my schedule and spent a Saturday acquainting myself with these recent additions. Marceline Vineyards, near Harrisonburg, was my first stop. Susan Rudolph Pleasant is the owner. She and her children started planting grapes in 2008 and sold fruit for a couple years before opening their tasting room in December 2017. One element of the Marceline strategy is to grow only varietals that make sens based on the local terroir and source other fruit from Virginia growers. The property is located inside a large pocket that drier on average than the rest of the valley. The Shenandoah Valley, by the way, is the driest region in Virginia, so the difference in rainfall is significant and ideal for viticulture. In addition, the property sits atop 7 underground rivers. Good drainage and mountain breezes further define the estate and lend to the cultivation of excellent fruit. Winemaker Micah McDermott is Susan Pleasant’s son. He was previously assistant winemaker at CrossKeys and was later the head winemaker at Barren Ridge before moving home to oversee production. Tim Rausse consults with the winery. Between Rausse and McDermott there is serious experience at Marceline. Production currently stands at about 500 cases annually, with a long-term goal of 2500 cases. All of the wines are exclusively single varietals and there are no plans to blend, which sets them apart from the vast majority of wineries in the state. Six wines were on the tasting menu. A pair of Chardonnays started things off. Both were perfectly balanced. The stainless steel Chard was full of tart apple notes. The reserve Chard was lightly oaked, which gave it a bit more complexity without muting the fruit. There was an excellent, dry-style Merlot rosé. The 1.7% residual sugar presented a level of sweetness that was barely perceptible, but really brought out the bright strawberry notes. he Cabernet Franc and Cabernet Sauvignon were both estate grown. The Cab Sauv was deliberately done in a lighter, Italian style that was drinking well. The Cab Franc, however, was my overall favorite. It lacked any hint of green, but displayed pepper and spice that mingled with the fruit. It was an excellent, well-crafted wine. In addition to a quality lineup of wines, the overall experience was exceptional. The owners work at the tasting bar, so they are able to answer nearly any question and there are no gaps in wine knowledge. In addition, the venue is well laid out with ample space indoors and outdoor seating that overlooks the vineyards and surrounding farmland. 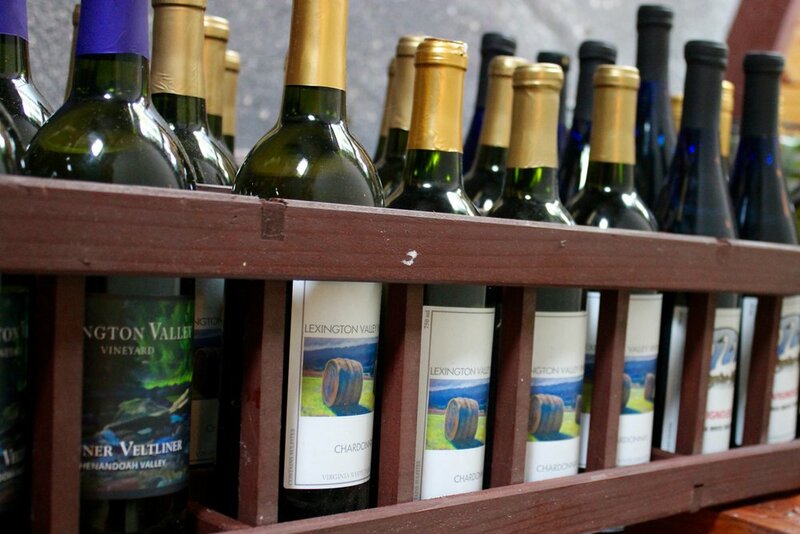 Located near Harrisonburg, Marceline Vineyards is clustered with several other wineries of note. It is also very near Interstate 81, so it is easily accessible. Basically, there are no excuses for not stopping in. This is a winery that I feel good about recommending. After you visit, please let me know what you think. 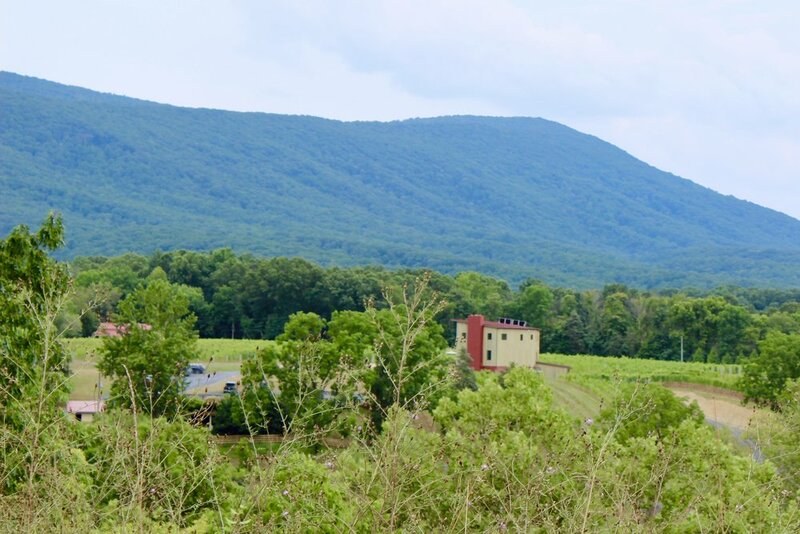 Up in the northern Shenandoah Valley, not far from the town of Strassburg, there is a small boutique winery named in honor of the panorama visible from the property. Mountain View Vineyards sits inside a fairly secluded mountain valley in an area that is mainly agricultural. Despite this, it is not far from the intersection of Interstates 66 and 81, so it is far more accessible than you might imagine. It was the beauty of the location that allowed F.A. Hymes to lure his wife away from the city, so that he might grow grapes and make wine as a retirement project. He started planting his three acres of vines between 2002 and 2004 and practiced making wine for about three years. In 2009 the first commercial vintage was bottled. Since that time, Hymes has insisted on using only estate fruit and production levels are between 200 and 500 cases annually. The small size allows Hymes to do nearly all of the work. He is able to able to assemble family and a few friends and complete harvest in a matter of hours, which allows him to react quickly to the threat of heavy rain. In addition, the small vineyard enables Hymes to manage his crop on a row by row and almost vine by vine basis. In other words, a high level of attention to detail can be applied in the vineyard, which pays great dividends in the winery. I have heard many stories about how winemakers learned their craft, but this one is unique. Hymes uses a small book entitled Beginner’s Book of Winemaking” by William M. Konnerth. The copy in Hymes possession is dogeared and worn, so it has clearly been used and he insists that it is largely a matter of following the instructions. The result will be good wine. So that’s the secret to the Mountain View wines and I have to admit that it seems to work. I tasted five wines during my visit and I must say they were all well crafted and interesting. Of the ones I tried, I was particularly taken with three. The dry-style Seyval Blanc was still young and a little green, but was crisp with nice citrus notes. There was an off-dry peach wine that was well balanced and just screamed to be served on a hot summer day. My top pick of the tasting, however, was the Chambourcin. If you follow me at all, you know I seldom say good things about this varietal, but the Mountain View offering was exceptional. It is a dry-style wine that is full of ripe fruit and mild tannins. Importantly, it lacked the off-putting astringency that often occurs with Chambourcin. It one of the most popular offerings and it is easy to see why. You will need to make and appointment for this tasting, but it seems to be largely a formality. The owner is typically working around the winery and vineyard. I found him to be very accommodating, happy to details of his small operation and, with good reason, very proud of his wine. I think this is an important stop for anyone exploring Virginia wine country and it is an absolutely stunning venue. So after you stop in, I really want to know what you think. I first visited Muse Vineyards back in 2015 after they won the Virginia Governor’s Cup. It was almost as an afterthought that Robert Muse and Sally Cowal decided to enter their 2009 Bordeaux blend in that 2015 competition. I certainly knew about Muse Vineyards, but the win accelerated my timeline and I immediately called and made an appointment. I have been a huge fan ever since. The approach to Muse and the property are absolutely stunning. As you drive down toward the North Fork of the Shenandoah River, the trees open up to provide a glimpse of the valley and the vineyards. The crossing point is a one-lane bridge that is technically a low-water crossing. (I have heard stories about the waters rising to flow over the bridge, which effectively cuts off access to Muse.) In any case, you are almost at water level when you cross this very scenic river. Then you enter the property and the road winds through the vineyards until you reach the tasting room that is perched on the highest point offering a commanding view of the surrounding valley. Muse Vineyards was and still is a small, boutique, Shenandoah Valley winery. On my first visit, they were open only by appointment. In November 2016, however, a well-appointed tasting room opened. So Muse now has regular hours and a professional, customer-oriented staff. Robert Muse is the winemaker and there were early indications that he would become a top Virginia producer. Muse studied and took a winemaking course with Jim Law of Linden Vineyards, which greatly influenced his approach to the craft of making wine. He originally consulted with Matthieu Finot from King Family, who is a one of the state’s most talented winemakers. It was Finot who advised Muse on the creation of the 2009 vintages. The quality of the estate fruit was another indicator. Central Virginia wineries like Stinson, Blenheim and Gabriele Rausse sourced grapes from Muse. It is a well-known fact that Rausse does not buy inferior fruit. Currently, Muse is consulting with Tim Rausse. So while Finot has moved on, someone equally talented stepped into the role. A couple more acres of vines were planted, which brings the total to 30. There is additional acreage that can be devoted to grapes, but there are no immediate plans. One thing that remains constant is the quality of the wine. There are some grapes cultivated in the vineyards that are not widely grown in the Commonwealth. Aside from Bordeaux varietals, there are Rhones like Grenache, Syrah, Mourvedre, Marsanne and Roussanne. The Italian vinifera Sangiovese and Teroldego round out a roster that is full of surprises. I tasted through the list of offerings. It was one of those rare tasting room lineups that was completely solid. All of the wines are excellent, which makes it difficult to pick a favorite. We started with a Sauvignon Blanc filled with hints of minerality, bright citrus and crisp acidity. It was a lovely wine, but I particularly liked the Thalia simply because it is unique among Virginia whites. It is a Rhone-style blend of Marsanne, Roussanne, and Viognier that has an almost creamy texture that mingles with the honeysuckle and peach notes. The reds included a light-bodied Gamay and another Rhone blend of Grenache and Syrah. Both are well-crafted and great wines in their own right. Clio, however, is the wine that won the Governor’s Cup and it is the flagship offering. Similar to the 2009, the 2012 was jammy, filled with cherry and chocolate notes and had a very long finish. As an added bonus, I was able to sample the soon-to-be-released 2013 Cabernet Franc. It was big for a Cab Franc. In addition to ripe fruit, it had a sort of earthiness. It is a great example of that varietal and I will return just to purchase a few bottles. Simply put, Muse Vineyards is a winery that continues to make world-class wines. Regardless of where you live, I would not let distance factor into a decision to visit. Some of the state’s top wines are coming out of this small, boutique operation. You need to get over there and see for yourself. After you do, please let me know what you think.